En gros, il quitte l'Utah pour rejoindre le Wyoming et donc McT pour lequel il va écrire un deuxième scénario. McT le charge aussi d'être son réalisateur de seconde équipe sur Warbirds dont le tournage devrait commencer cet été en Russie et/en Corée du Sud. "Goodbye, Utah. I'm going to miss you. But only a little. I'll be back someday soon. I'm headed off to Wyoming to write a second screenplay for John McTiernan (and my third screenplay so far this year!) and he's asked me to be his 2nd unit director on a movie he's shooting in the late summer in Russia and/or Korea. So Yesterday I hooked up the horse and wagon, and Jessica and I hit the trail. I don't know where we'll go, but it's going to be an adventure. And if the writing work keeps coming, I may just travel for the next several years." 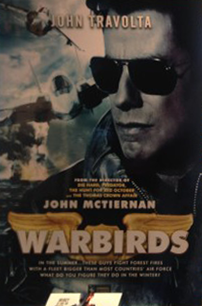 Warbirds n'est plus présent sur la page de John McTiernan du site IMDB. Il était, avec Thin Rain, listé dans ses projets en développement. Sur la page Pro du même site, Warbirds existe toujours mais sans McTiernan crédité en tant que réalisateur (la mention in talk était jusqu'à aujourd'hui utilisée) et scénariste. Hannibal Classics is pleased to announce we will be attending the 2016 Marché du Film in Cannes with several exciting new projects and a fantastic catalogue of films! New for 2016 is the recently completed WWII epic USS Indinanapolis: Men of Courage, starring Nicolas Cage, James Remar, Tom Sizemore, Matt Lanter and many more. Hannibal is also in production on Vengeance, a taut action thriller starring Nicolas Cage, who also directs. Our upcoming projects include the action-packed Red Squad, the tense cop thriller Crimson Blues, and a soon-to-be-announced disaster movie. Our recent catalogue includes Heist A/K/A Bus 657, starring Robert De Niro and Jeffrey Dean Morgan, The Prince, starring Bruce Willis and Jason Patric, and Rage A/K/A Tokarev, starring Nicolas Cage. Check with Charline or Kristy from our sales team for an appointment, or stop by our booth, located at Lerins S13 in Cannes to discuss our exciting line-up. Also, check back here for more updates on possible screenings at Cannes. En gros, l'habituelle annonce de sa participation au Marché du Film du Festival de Cannes qui aura lieu du 11 au 22 mai.